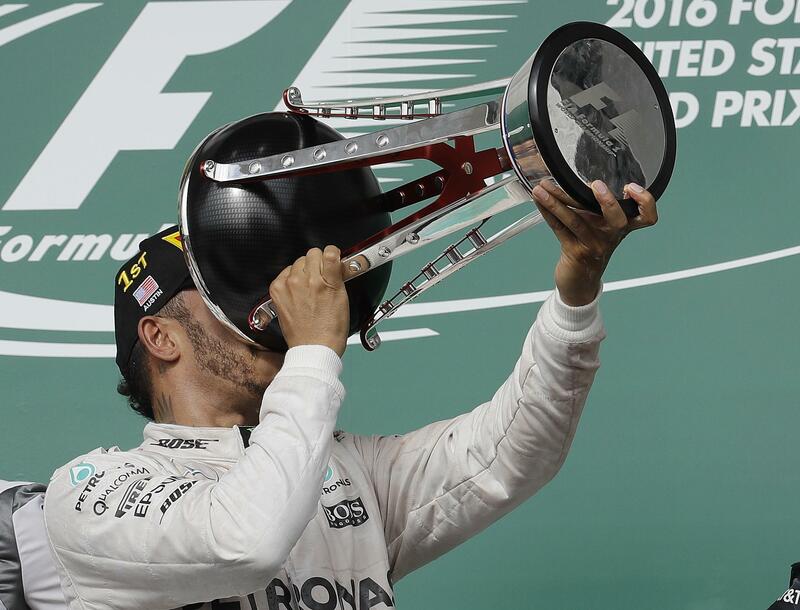 AUSTIN, Texas – Lewis Hamilton got the victory he needed to keep his Formula One championship hopes alive. Now he needs more, and he needs Mercedes teammate and rival Nico Rosberg to make a mistake or have a bad race. Hamilton won his fourth U.S. Grand Prix in five years on Sunday, bolting from the pole position and cruising to an easy victory that cut Rosberg’s lead to 26 points with three races left. Victories won’t be enough for the two-time defending champion to keep his title. Rosberg still holds a relatively comfortable lead heading to next week’s race in Mexico City where he won last year. Two seconds and a third in the final three races will be enough for Rosberg to earn his first season title and match his father Keke Rosberg’s 1982 championship. Rosberg is keenly aware that he controls his destiny. Unlike last season, when tensions boiled over in the post-race cool-down room and Rosberg tossed a podium cap at Hamilton’s face, the German was all smiles Sunday as Hamilton celebrated his win. Rosberg shrugged off any suggestion he has lost any momentum. The Mercedes duel now heads into a stretch of races Rosberg dominated last season when he reeled of victories in Mexico, Brazil and Abu Dhabi. He’s failed to finish only one race this season and has only four others that didn’t end on the podium. “It’s a pity it didn’t work out for a win,” in the U.S., Rosberg said. Rosberg insists he won’t settle for the safety of second place and will push for wins over the final stretch. He made a late charge over the final 10 laps to shave nearly five seconds off Hamilton’s lead, but never threatened to overtake him for the win. Hamilton effectively won the race – and Rosberg lost it – on the first turn. Hamilton had been plagued by poor starts all season and had won won only three of his previous eight races from pole position this season. He finally got the jump he needed with a burst off the line he’d been missing. “It worked perfect today,” Hamilton said. Hamilton bolted into the 110-foot, elevated left turn that whiplashes the cars back downhill. He was first to the corner, held position and was off and running. Rosberg was pushed into third when Red Bull’s Daniel Ricciardo cut under his inside and edged him out at the top of the turn. Ricciardo finished third for his second U.S. Grand Prix podium in three years. Once comfortably in the lead, all Hamilton had to do was hope he didn’t run into similar problems two races earlier in Malaysia, where he was cruising toward victory before an engine failure knocked him out of the race late. “I was concerned the whole race the car wasn’t going to make it … right up to the line,” Hamilton said. Ferrari’s Sebastian Vettel finished fourth. The Haas F1 team’s Romain Grosjean finished 10th, earning the rookie American-led team a point in its debut appearance in its home race. “I’m not here to finish fourth!” Verstappen snapped back. He later came in for a pit stop when his team wasn’t ready, telling them he mistakenly heard an order on the radio. Published: Oct. 23, 2016, 6:47 p.m.